Art Talk: SFTIO Blog Hop!!! 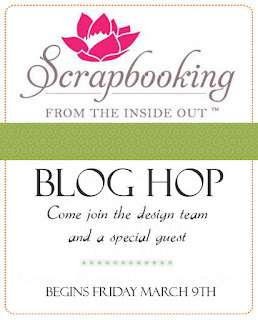 Welcome to the Scrapbooking From the Inside Out Grace Blog Hop!!! If you are just beginning at my blog, make sure you go back and begin at Melissa's blog (see links below). If you got here from Bonita's blog, then you are on the right track and in the right place! This layout was the first one I did with the kit and felt that this photo was perfect for the colors and embellishments in this kit! The vintage photo is of my maternal Grandmother who I called Nana. She was a beautiful bride! I found these photos in a pile of extra photos from my grandfather's albums when he passed away. It was like I hit treasure when I found them! I was struck with the grace of her look and dress. They got married very soon after they met. My grandfather was in the Army and was a ranking officer when they met through mutual friends and they made a beautiful couple. I always idolized my Nana and her southern grace. She was from Texas and grew up with little money but a lot of love! Her family was very close and they were extremely crafty and artistic. I'd like to think I got my artistic interests due to her and my Mom. She had great taste, even if it did travel to a more feminine appeal than I like, and she was always dressed well and generous with her love! I fussy cut the flowers and used pop dots to raise them up in areas. 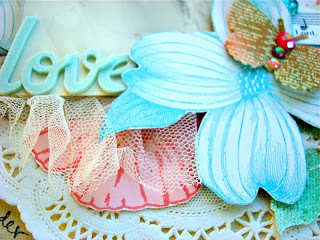 I also used the tulle ribbon to add feminine touches under the photo. The mistables were perfect to add a bit of color when misted with Glimmer mists. I love all the spring-like colors and feminine feel to this kit! 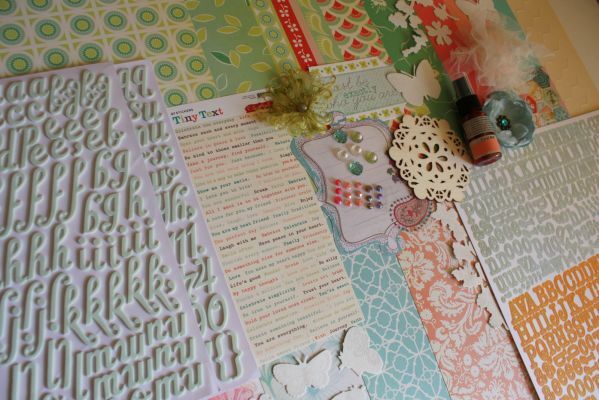 This layout doesn't have much journaling because the photo speaks to me of grace and love... isn't that what this kit is about? I used some droplets of the spray mist to embellish the paper and sanded the embossed shapes to bring them out. 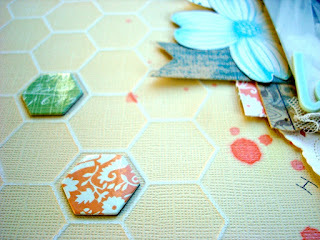 The hexagon shaped chipboard stickers were perfect to fit into the shapes. I used them sparingly to just give a hint of design and color. What to know what you are going to win? 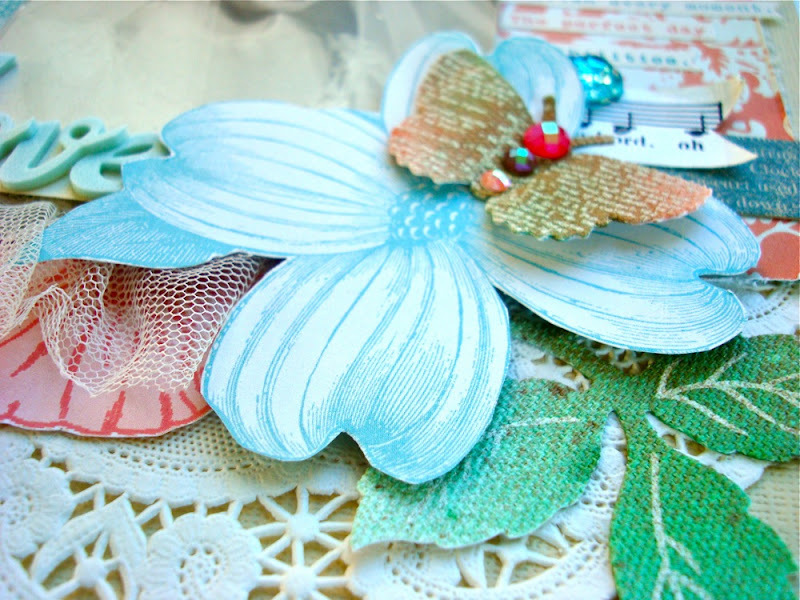 Well, if you like the colors and materials I've used, you can win one of the kits! To be eligible to win the GRACE kit, leave a comment here on my blog post. Tell me what GRACE means to you..
Each blog you visit and leave a comment on, gives you more chances to win the kit!! Comments can be made until 6:00 P.M. PST on Saturday, March 10th. The hop begins on FRIDAY, MARCH 9th through SATURDAY, MARCH 10th. I love that layout Jen... it's really beautiful and you should submit it!! I LOVE that layout... it's so gorgeous and I hope you submit it!! It deserves to be pubbed. Your page is beautiful! When I think of grace, I think of receiving unconditional love...despite the wrongs I have done...and doing the same for others. So happy to have found you! Love the colors. Gorgeous LO Jen! It reminds me of my own Grandma, and how I always felt she lived with so much grace. Grace is living with love, truth, forgiveness and true to the heart. Grandmothers such as ours truly define the word! Lovely layout- what a precious picture! This is just beautiful! 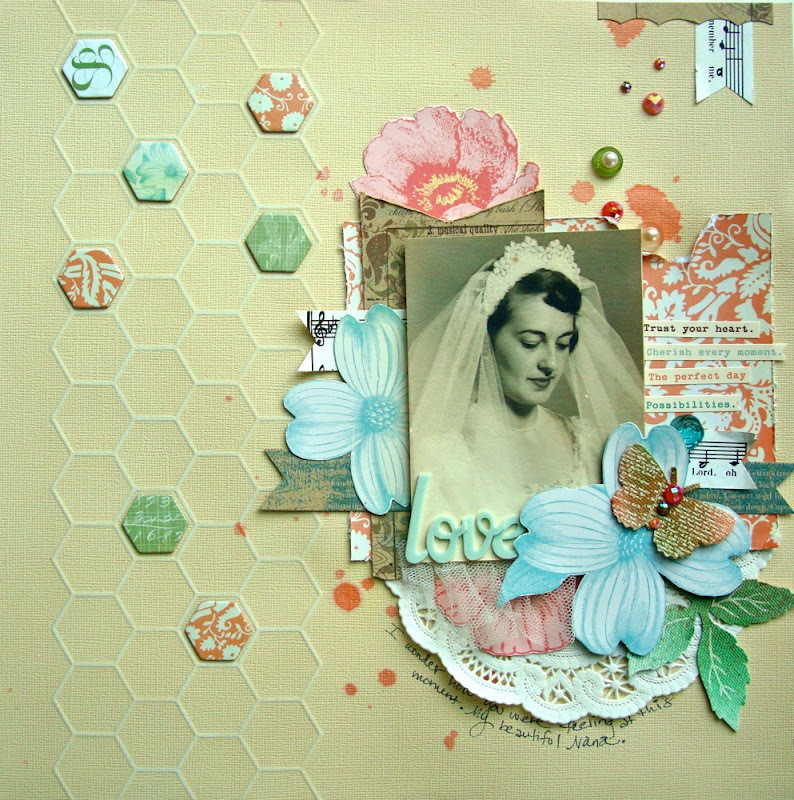 Love that hexagon grid and how you used those little chipboard pieces, all the layering of the elements, and the vintage photo. So special. What grace means to me. It means that I am saved, and it means that I am loved by my family and friends even when I am undeserving. this is gorgeous! 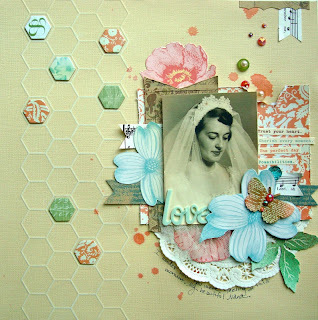 love the embossed hexagons, and the pops of color on the neutral background! that's a beautiful picture too! Grace to me is goodness and compassion. What a beautiful layout. In addition, the story behind it spoke volumes as well! I called my Grandmother Nana too! I loved the sweetest little butterfly with the printed words so subtle in the background. Nice touch. To me Grace is all about the physical body today. We are the most graceful, yet powerful machines made! Happy March. So beautiful! I love what you did with the honey comb shapes. The LO even co-ordinates with your blog, I love the way you used the hexagonal paper, such a lovely soft feeling to this one without being obviously vintage. I love this LO, Jen! Beautiful picture, beautiful colors & composiition, beautiful everything. Grace is kindness and forgiveness, and full of love. What a beautiful layout. It looks like how I define grace, which is as an inner elegrance. Such a gorgeous page! I love everything about it. From the pic of your grandmother (so pretty, poised, & graceful) to the misted butterfly & hexagonal shapes, this layout should be published in books & mags. Your layout is GRACE! I define grace as unconditional love & forgiveness; being able to walk with your head held high, no regrets, no unfinished business; to give without expectations in return; to be compassionate & empathetic to situations you may know nothing about, but none-the-less to be able to listen without judgement! I love your connection with your Nana because I love how families are strung together joining our past and our future. I love seeing how characteristics and talents get passed along, too, not just hair color or eye color! My middle name means "full of grace" so as I have been given grace, I must share it with others in whatever way I can! Beauty and calm under even the worst circumstances. Love finding old family photos! What a beautiful page and a lovely grandmother! Grace to me is kindness, forgiving, forgetting, giving from the heart, speaking softly and having open arms.